Plays through mature woods along Pine Lake. Many nice trees, rocks and scenic views. Multiple tees with very little water hazard. Discs for sale at concession stand (at separate lake in park). 3 sets of concrete tees per hole. Reds (12') @ 5068', Whites (14') @ 7006' and Blues (16') @ 8619'. In Punderson State Park, 0.6 mile west of Rte. 44 on Rte. 87. Left into park, take 1st right to end of drive. 1st tee is off end of parking lot down Musher trail. Enjoyed the course very much! Played it not long after it opened! Many lake views make it an interesting course! I like the hole that has a tunnel of trees.I want to play when the leaves are on the trees ,They should add some toughness to the course ! First few holes feature views of the water. then into the woods for the fun stuff. A nice putting basket greets you as you head for hole 1 ! 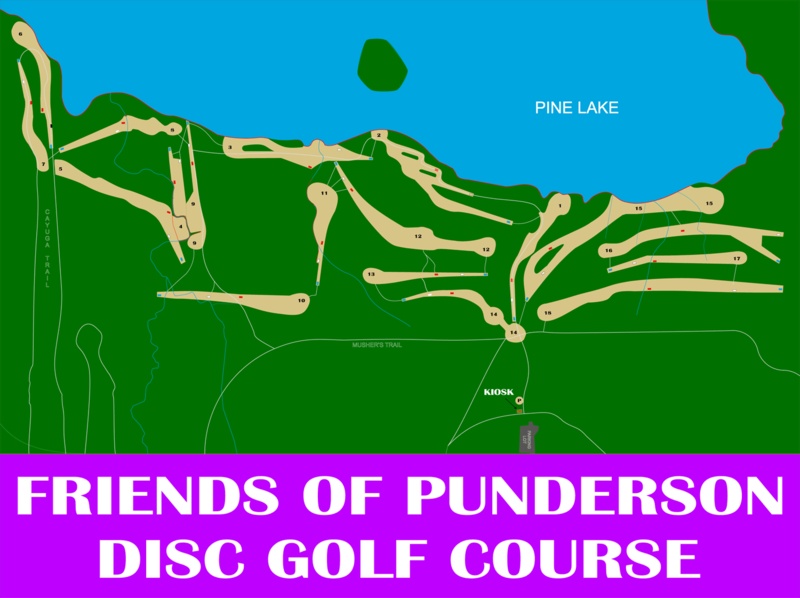 This is the best course in Ohio. I can not find a single fault with it. The teepads are large and perfectly positioned. Every teepad is easy to locate due to excellent navigational signs through the course. Every type of shot is available here: tight tunnel shots, open yet challenging long shots, elevation changes. The baskets are top-notch. Even the scenery is amazing. Worlds could be held here, no question. First course I ever played and it's still my favorite after playing many other local courses. It is in a secluded area of the park with beautiful views. The course is pretty complete and groomed with large concrete tee pads. Can't wait for the island hole to be finished on #2.